Matching gems to cast elemental spells, buying more powerful weapons and armor, equipping runes that unlock powerful skills and spells — Backflip Studios' Spellfall is everything I've ever wanted in a puzzle RPG, plus agressive microtransactions. Since my whirlwind love affair with the original Puzzle Quest, any game that combines role-playing mechanics with match-3 puzzles is capable of grabbing my attention, but keeping it is another matter entirely. A puzzle RPG needs a certain degree of quality and polish to keep me playing after the first few rounds. Spellfall has that quality and that polish. Bright, colorful gems on the puzzle board that vanish with real impact, distinctive 3D models for the hero and his endless horde of enemies — Backflip's even included my favorite non-essential RPG feature, equipment and weapons that change the appearance of the player (it's stupid how important that is to me). The first few matches were pure magic. I quickly I quickly grasped the game mechanics — swap any two gems on the board to create groups of three or more like elements. 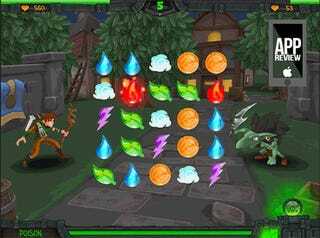 Combine four or more and create more powerful gems that generate full lines of fire, water, ice, lightning or plants. 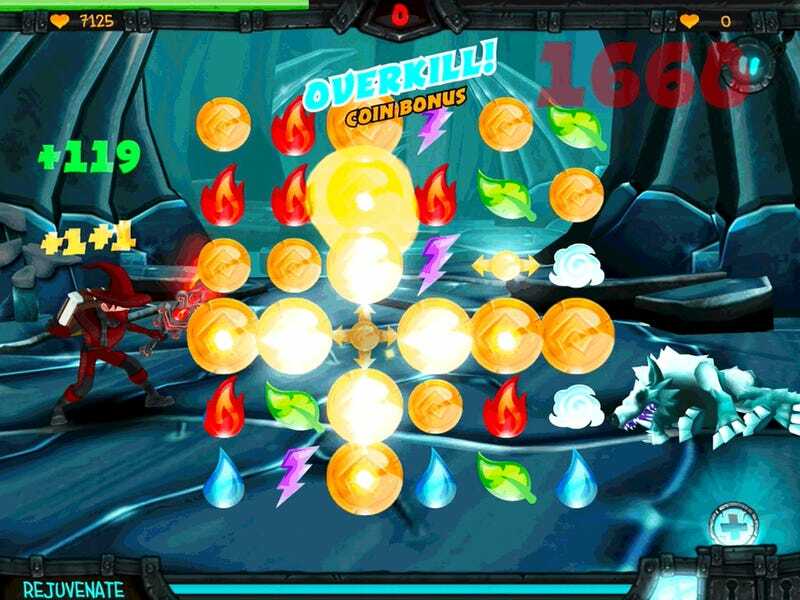 The player has a certain number of turns before the enemy attacks, so making smart, efficient swaps is the key to successful combat. 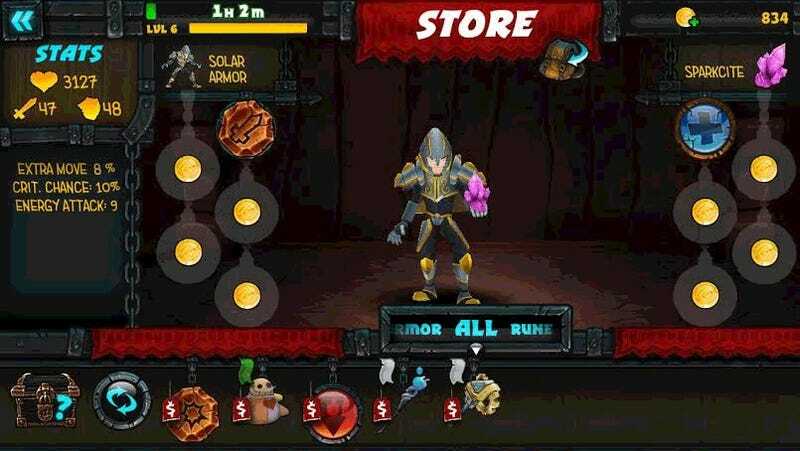 After the first round I was introduced to the store, where coins earned in battle can be exchanged for weapons and armor, each with rune slots that can be equpped with special spells or passive bonuses. It was perfect. I was excited about playing Spellfall. But then I noticed the timer atop my health bar, and the little healing icon on the map screen. Clicking it allows me to pay gold to be fully healed, or I could just wait an hour for a full timed refill. Hrm, I didn't like that. I had a healing rune equipped that allowed me to collect water gems in battle to charge a spell that recovered a sliver of health, but not enough to keep me playing for long periods. And what would happen if I died? Oh. That was going to be a problem for me. After a particularly grueling battle — and the battles get really grueling by the end of the second map segment — the urge to drop a dollar to finish the battle off would be very strong. Not to mention the equipment cost. After every battle a new item is rotated into the store, its rarity indicated by color-coded ribbons. Rare blue items cost several thousand coins. I've seen epic purple items priced in the tens of thousands. By the third map segment I was losing nearly all of my health in every battle, and only earning a few hundred coins for my trouble. Patience pays off in Spellfall. 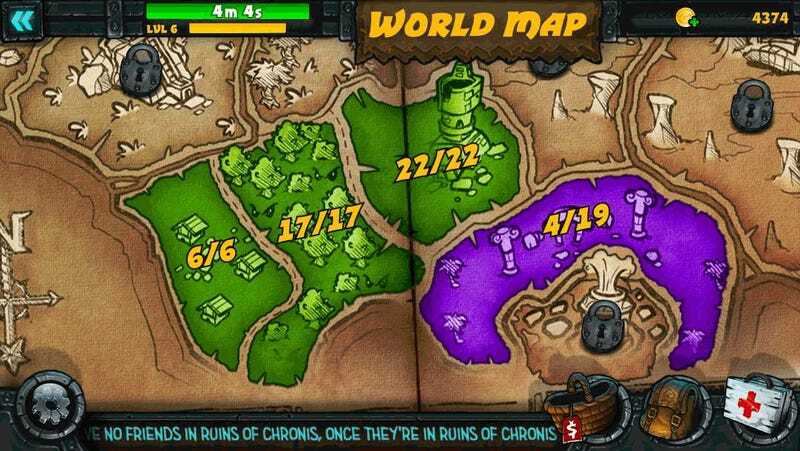 Over time, each conquered map segment generates coins, just as the player's health refills over time. Every day the player can open a chest containing a weapon, rune or suit of armor for free. Were I a patient man, I could bide my time, play in small chunks and be relatively well-off. 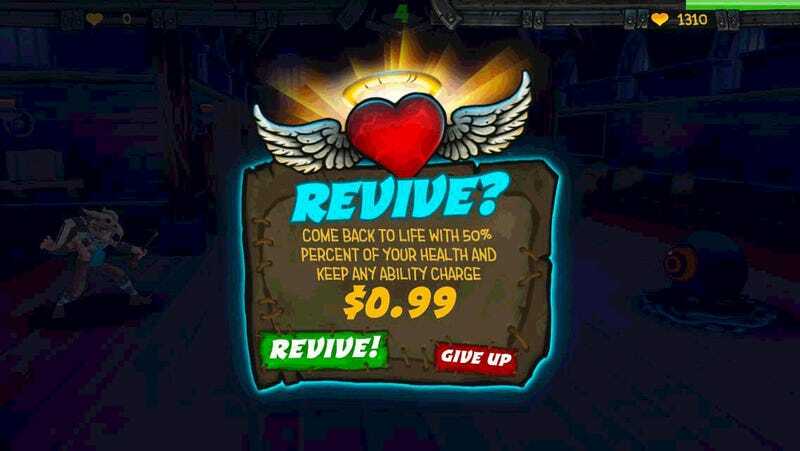 But I am not a patient man, so I spent $10 on coins (on top of two revives I've spent $12 on the game so far). I purchased an expensive suit of armor, charged into battle, and noticed little or no difference in the amount of damage I was taking, despite the armor rating of my new piece being twice that of my previous one. I was excited for Spellfall. Now I'm just disappointed. Disappointed in the game for ramping up the difficulty at such a brutal pace that I felt compelled to spend money on betteer equipment. Disappointed in myself for thinking I could spend only $10 to erase the game's problems. I have no problem giving a studio money for a free-to-play game — the key is making me feel like I don't have to. Spellfall doesn't. All of the pieces of an excellent puzzle role-playing hybrid are present in Spellfall, but they can't come together with this clumsy free-to-play model in the way.